Kelp contains acids that can bind to toxins in your body, explains Bennett, who adds that, combined with heat, kelp or seaweed penetrates your skin and draw out impurities. Natural health proponents maintain that high levels of toxins in the environment overwhelm various systems in the body, including metabolic processes and the immune system. According to Brenda Watson, author of "The Detox Strategy," this effect is referred to as the "body burden." She points out that high toxin levels in the body may lead to medical conditions, such as allergies, fatigue and reproductive problems. Detoxification methods such as sea kelp powder baths help to remove toxins from your body and may improve overall health. Like other types of seaweed, sea kelp is loaded with skin-nourishing nutrients, such as Omega-3 essential fatty acids and polyphenols. According to the University of Maryland Medical Center, vegetarian sources of the essential fatty acid, docosahexaenoic acid, or DHA, come from seaweed. In a study conducted by Ohio State University, researchers found that polyphenols in seaweed --- applied topically or taken orally --- significantly reduced the number of skin tumors in hairless mice by 60 percent. They also reduced the size of tumors by 43 percent. Seaweed ingredients are also featured in anti-aging and other skin care products such as soap and masks, but you may also get some of their benefits from taking a sea kelp powder bath as well. 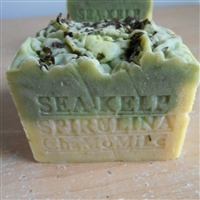 Sea Kelp Powder is a wonderful detoxifies which helps reduce cellulite. Besides this, it offers loads of other benefits for our skin. It helps fight Acne, Wrinkles, Lightens Dark Spots and heals sunburn. Sea Kelp/Marine Algae/Seaweed is a type of plant found in the sea. Sea Kelp has been widely used in face/body firming and anti-cellulite .